1696 Heritage Group is happy to announce that we have received a grant from the Rhode Island Council for the Humanities for our fall program Gilded Age Newport in Color. This program is hosted by the Preservation Society of Newport County and will be held at Rosecliff, in historic Newport, Rhode Island on October 16th, 2014. With assistance from the Newport Historical Society, 1696 Heritage Group is presenting a public lecture, online exhibit, and a virtual walking tour. 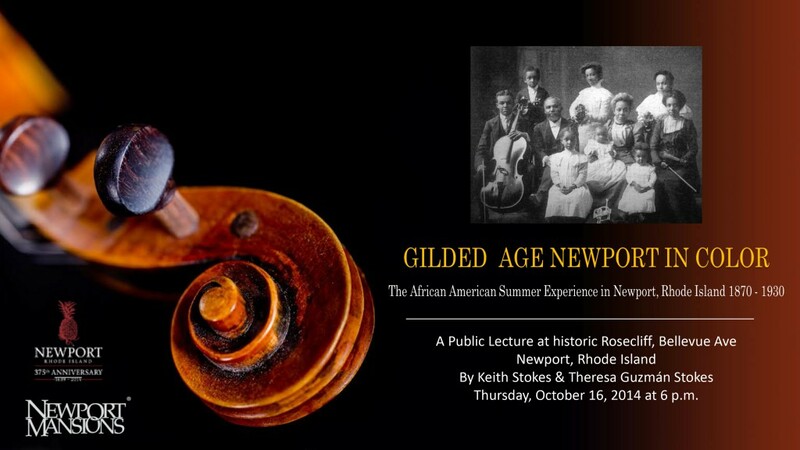 Gilded Age Newport in Color is an exploration of the lives and accomplishments of the important African American political, business, and artistic leaders that would travel to Newport from Boston, New York, Philadelphia and Washington to take part in a rare opportunity for persons of color within 19th century America for free social and cultural interchange. We are excited to be presenting this largely unknown chapter of history; to bring public access, learning and discussion of an important piece of Newport’s diverse cultural heritage to the public audience. More details and registration information will be available soon. This entry was posted in Uncategorized by Theresa Guzmán Stokes. Bookmark the permalink. I am working on a documentary about colonial agriculture in South County and would be interest in talking with someone knowledgeable about the Narragansett planters. If you know someone who would be willing to speak with me I would be grateful.